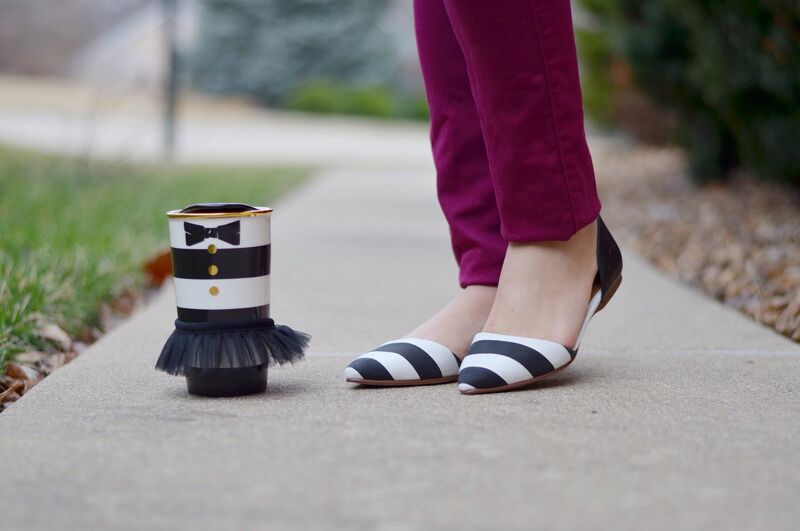 As I was walking out the door to snap pics of this outfit, I couldn't resist grabbing my Alice + Olivia tutu mug. I've had her since the holidays, and she's my most favorite mug ever. (I call her Tootsie.) Every time I wear anything black and white, people ask me if I've purposely matched my mug. The answer is always no - it's merely a coincidence. Although, I'm quite jealous of Tootsie. I've been on the hunt for my perfect tutu/tulle skirt, and I just can't find one that isn't midi length. So, if any of you see some good options out there (that aren't a trillion dollars), let me know! Linking up for: Color Brigade, What I Wore Wednesday, Random Wednesday, The Hump Day Blog Hop, I Feel Pretty, Whatcha Wearin Wednesday, Empty your archive. That's the next thing I need to aspire to! :) That top is great and I love the color combo with the pants. Thank you! 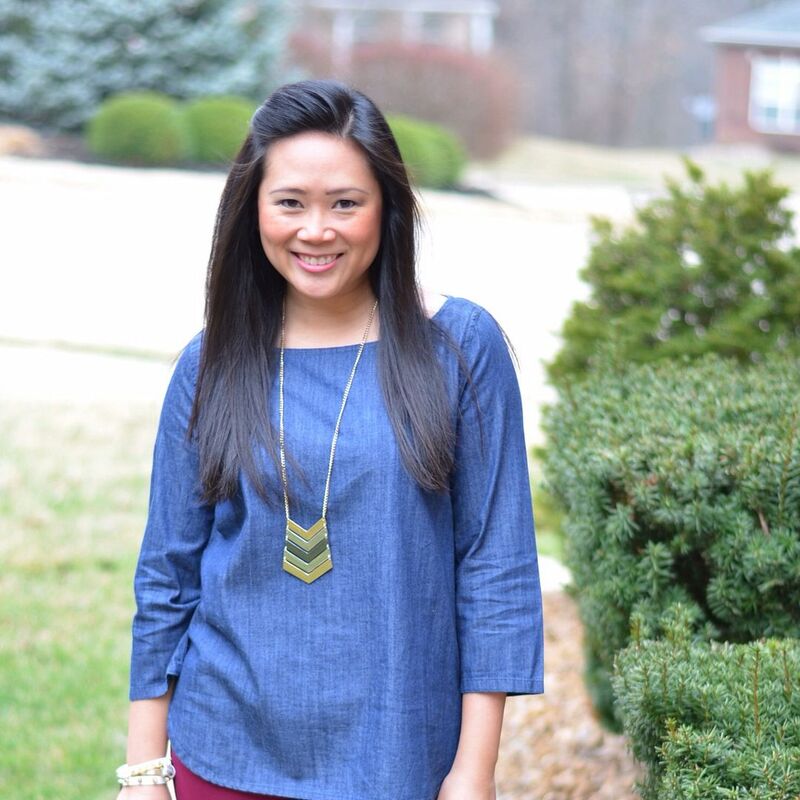 I didn't know how I would feel about a chambray popover, but the fit is so easy, I was amazed how much I loved it! I wasn't sure about that top but I love it on you and I love it with the maroon jeans. That mug is so cute. Who knew that mugs are now accessories. I also like tulle skirts but I just can't pull that off. 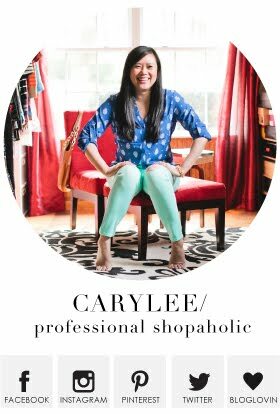 I hope you find one because I'm sure you will style it flawlessly. I'm definitely a fan of this top! I would recommend for sure! It will be a happy day when I'm able to finally find my perfect skirt! Oh, I love this outfit! 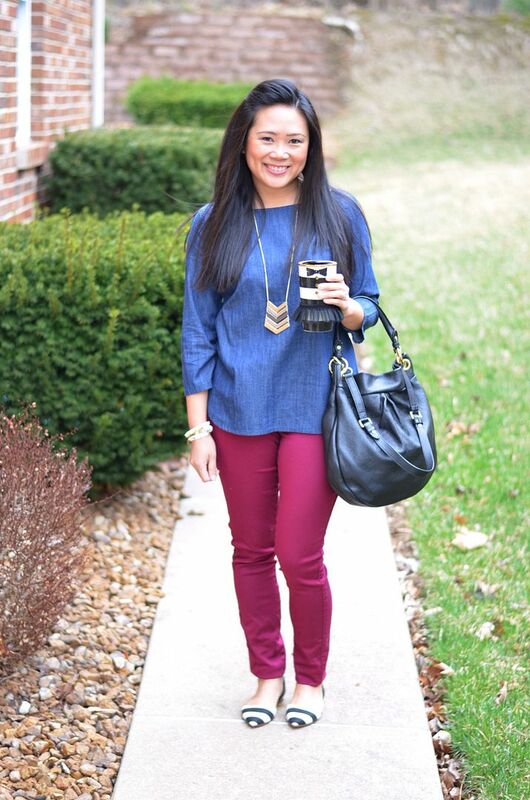 That top is perfect with the maroon jeans and I'm obsessed with your flats! I need them asap!!! Thanks so much Erica! They've been in and out of stock! I hope you get your hands on them somehow!! Absolutely LOVE the color of those pants!!! They are great! I wish Express would come out with their colored skinnies again! I bought them in this color and more of a rust red color, though honestly, they're identical. I wear them so much, I wish I had bought more colors! That is actually quite freaking genius to check kids! I'm so glad you said that. And now I'm off to look! You look charming in this outfit, I adore combo of jeans-like (or it's jeans?) blouse and colorful pants. And your flats are cute too! Thank you so so much! I'm so happy with how this turned out! Little pieces of happiness! Yes, I am loving everything chevron lately!! Thanks! I've gotten so much use out of them! What a cute mug! : D lol I really love your outfit! Isn't it the best!! Makes me so happy! Wish everyone could have this much! It's sooo hard not to! I am just such a fan of wide stripes anyway! It's perfect! What a cool mug - it's so original! Black and white is so classic - I love that you have incorporated your style into your coffee mug too :) LOVE those shoes! Thanks so much! when I first saw this mug, it was love at first sight! So perfect! What a cute mug! Love how it coordinates with your shoes, even if you didn't plan it. Lol! 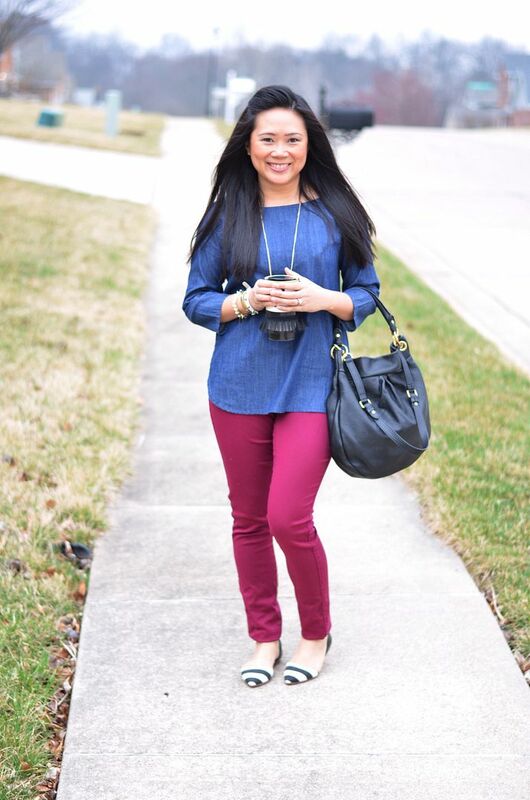 Super cute outfit, the cranberry jeans look great with that top. Cute necklace too! 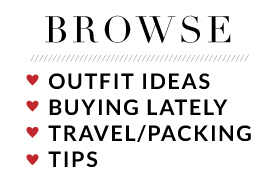 I've also been on the lookout for a cute tulle skirt but have yet to find one I love. I've seen several tutorials to DIY one though so I've considered that option, I'm sure you could as well. I am definitely way not crafty (or patient enough) to make my own! It would make my life easier though if that weren't the case! Yes! The mug and shoes combo is adorable. Great necklace, too! Found you via the Hump Day Blog Hop. Thank you so much for popping over! Everything about this outfit is cute (including the mug). I really like those shoes by the way, I click on the image and they don't have them :(. Also I have to say that great minds think alike, I have been looking for a tulle skirt for a while now, and they are still escaping my gasp...sigh. Well that's boo! They have been in and out of stock - I was actually wait listed for them then received the email when my size was available! I hope you find them somehow! As well as your own perfect tulle skirt! Thank you very much! I've only just recently gotten it, but it's already gotten so much use! Those shoes are so cute! Thank you! I'm enjoying them so far! Thanks, Rathana! This outfit makes me happy for sure! Thanks so much for the tip! Checking them out now!! This outfit is just perfect. I'd definitely wear every piece of it. Love how you match that adorable mug! I saw this on instagram and was simply blown away at the matching, so adorable. Awww - thank you! This made my day! Haha - well, I'm glad! It definitely gives me a big happy as well!